Four Princeton seniors have been named Schwarzman Scholars, including Amanda Morrison, currently a Gender in the Global Community student fellow at LISD, and Rebekah Ninan, a student fellow of both LISD's Program on Religion, Diplomacy and International Relations (PORDIR) and Project on Gender in the Global Community during the 2017-18 academic year. 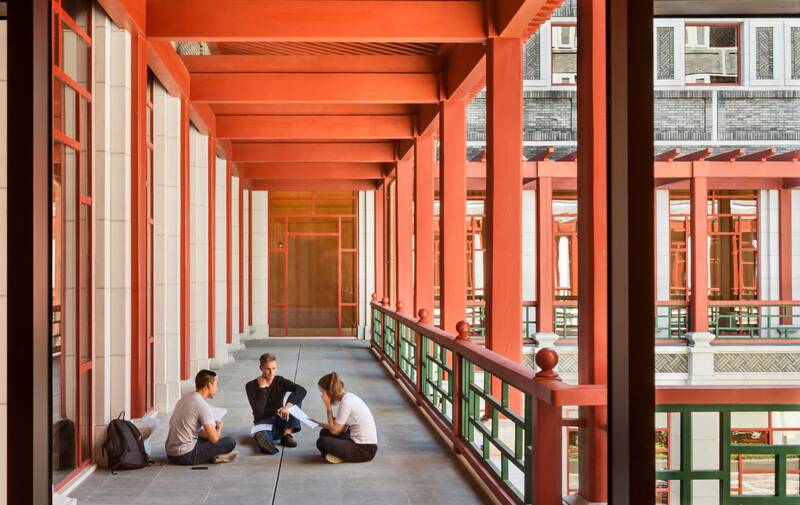 The Schwarzman Scholarship covers the cost of graduate study and living toward a one-year master’s program at Tsinghua University in Beijing. For its fourth class, 147 scholars were selected from around the world from more than 2,800 applicants. The scholars will study economics and business, international studies, and public policy. Courses will be taught in English by professors from Tsinghua, as well as visiting scholars, beginning in August. The program was founded by Blackstone investment firm co-founder Stephen Schwarzman. Amanda Morrison, a senior concentrator in the Woodrow Wilson School from Helena, Montana, plans to work at the intersection of visual storytelling and political affairs to explore ways in which video can challenge and deepen social and political engagement. Her current angle is examining developments in the Chinese feminist movement. Morrison, who is earning certificates in East Asian studies and visual arts (film production), is completing a documentary detailing the work of Chinese feminist Li Maizi. For her fall junior paper, she studied child abuse and protection in the context of U.S.-China relations. In summer 2016, Morrison completed the Chinese language immersion program Princeton in Beijing. She is a recipient of the Mallach Senior Thesis Fund from the Lewis Center for the Arts, where she is a film editing teaching assistant. Morrison has worked as a legal intern at the U.S.-Asia Law Institute in New York City and as a research assistant for its director Jerome Cohen, a professor at New York University School of Law, and for Truex at Princeton. She is a student fellow in LISD's Program on Gender, Law and Security. She’s also immersed herself in the film industry, serving in 2017 as an executive assistant for producers at the Allegiance Theater in Los Angeles and as a feature development intern for Skydance Media in Santa Monica, California. A resident of Whitman College, Morrison is president of 1080princeton, a student visual journalism organization; a student leader on the Vote100 initiative; and a magazine editor for Business Today. She was formerly chief of staff for Business Today’s inaugural Designation Conference, a board member of the Undergraduate Student Government’s Mental Health Initiative, and vice president of BodyHype Dance Company. Rebekah Ninan of Franklin, Tennessee, is completing an A.B. in politics with a certificate in South Asian studies. She plans to study economic and diplomatic relations between China and South Asia. At Princeton, Ninan has worked as a student fellow for LISD's Program on Religion, Diplomacy and International Relations and for the Project on Gender in the Global Community, in addition to serving as a research assistant for the Department of Politics. Ninan has interned for governmental and nonprofit organizations including UNICEF and Legacies of War. As an intern for the U.S. Department of State, Ninan researched refugee issues in South Asia, particularly the movement of the Rohingya in Myanmar, for the Bureau of Population, Refugee and Migration, Asia Team. She also worked with the State Department’s Office of Pakistan Affairs. Ninan is a 2018 Liman Undergraduate Fellow. She is a residential college adviser for Wilson College and previously was president of the American Whig-Cliosophic Society and director of the Adlai Tournament for the Princeton Debate Panel. Students spend a year immersed in an international community of thinkers, innovators and senior leaders in business, politics and society. In an environment of intellectual engagement, professional development and cultural exchange, they learn from one another and pursue their academic disciplines while building their leadership capacities. This experience will expand students’ understanding of the world and create a growing network of global leaders for the future.